It’s not surprising that many brides select red or burgundy for their bridesmaid dresses. Red is vibrant, elegant, romantic — the color of passion and love. Red also creates a wonderful contrast to a traditional white or cream bridal gown, which puts the bride even more “in the spotlight” (right where she deserves to be!). 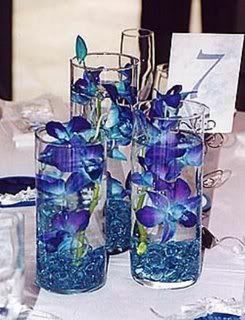 Red is such a strong color that choosing a beautiful bouquet of mixed colors creates nice contrast and visual interest. It’s best to include a least a small element of red in the bouquets, to “tie them” to the gown. Bouquets with a variety of blooms present more texture and shape and the “country” flowers in the photo above provide a less formal feel. Pairing red with red creates an elegant and sophisticated look due to keeping things monochromatic and seamless. Incorporating layers of red creates a look that has more drama and passion. 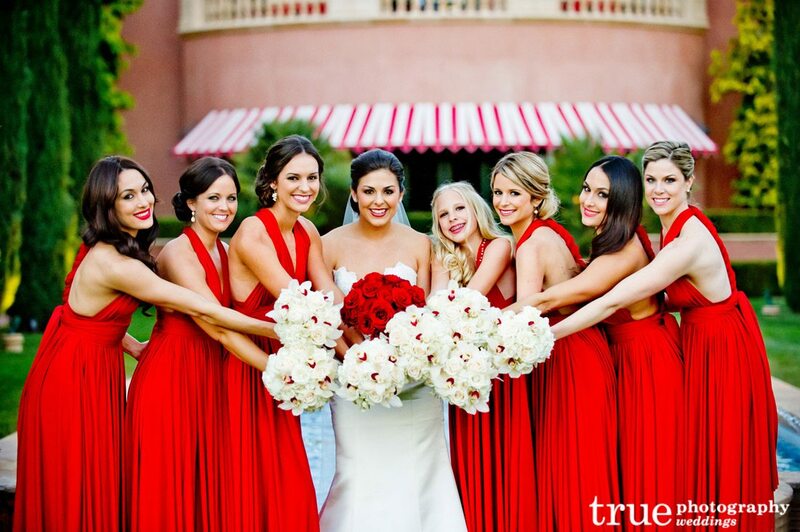 If the bride also carries a red bouquet it will link together a polished final look with her bridesmaids, and her glorious red bouquet will stand out against her pale gown. Best of all you don’t have to worry about choosing a new color for your palette as you know red already works and is included in your wedding day look! Another beautiful choice is to go for high contrast! White is a lovely choice for your bridesmaids’ flowers as it is clean, elegant and will really stand out against their red dresses. If you want to create an even more cohesive “matched” theme, choose small elements of red in the white bouquets, and opt for a dramatic red bouquet to help the bride be the star of the show. Another color that works beautifully with red, is yellow! 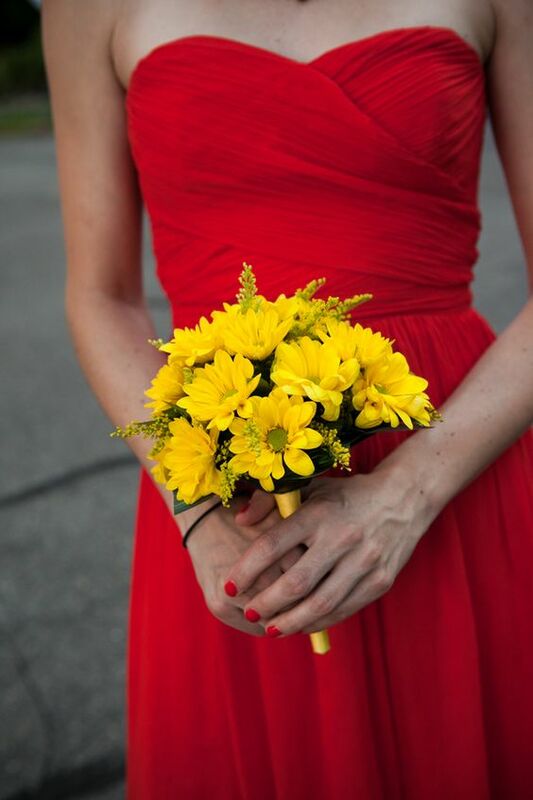 Many brides do not consider yellow but it’s warm and sunny brightness pairs well with the vibrant richness of red. The brightness of the yellow helps the flowers stand out against darker shades of red and creates a memorable pop of color to help your bridesmaids look their best. Remember, if you aren’t sure of your selection there are friendly and very knowledgeable floral experts ready to help you with suggestions and advice! Whatever you end up choosing, we hope that your wedding day is full of beauty and happiness. Summer is always a peak time for celebrity weddings! With the warmer weather and better travel opportunities we all enjoy more parties, and our DWTS celebrity dancers are no exception. Read on to enjoy the highlights! The popular actress and DWTS alumni (and now judge) married her NHL star on Saturday, July 8. Julianne, 29, wed Brooks, 34, in an beautiful outdoor evening ceremony in Idaho. The couple arrived by boat at around 6 p.m.
Julianne looked gorgeous in her custom $20K Marchesa gown with Lorraine Schwartz jewelry and a cathedral-length gown, while her GQ-worthy groom rocked his Brooks Brothers tuxedo. They couple made their vows in front of 200 family and friends at the Coeur D’Alene Resort and even included their dogs Lexi and Harley (looking dapper in flowered collars) in the celebration. 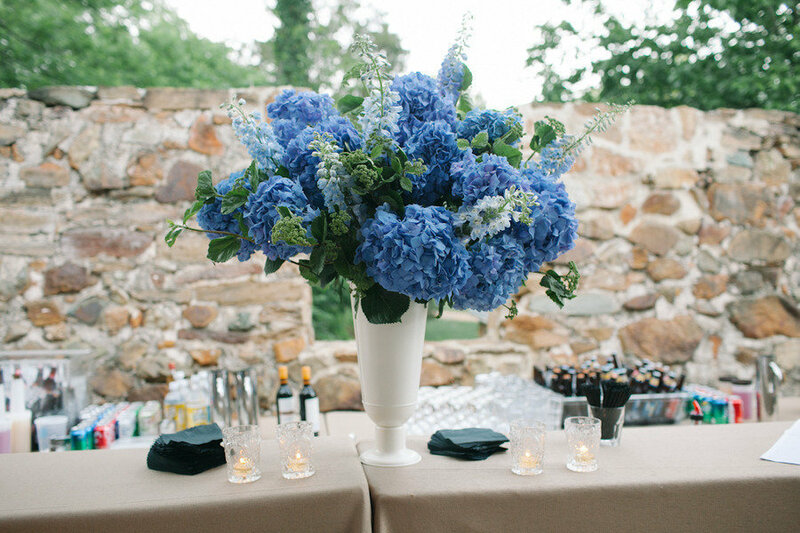 And our fave part of any celebration — the flowers — was also spectacular! The couple chose primarily roses and tulips and included flower boxes filled with a flowers and grasses. 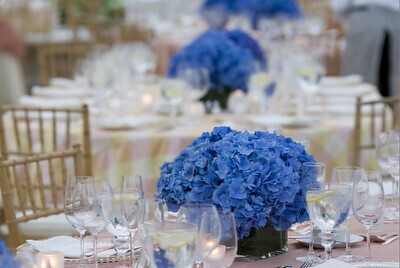 The flowers were done by Kristen Griffith-VanderYacht of Wild Bloom. The outdoor reception was enjoyed by many guests and featured a cocktail hour, catering by Le Catering, and a special mirrored dance floor. The event concluded with a wonderful fireworks display to cap off the happy celebration. Dancers Maksim and Peta also tied the knot on Saturday July 8, but in Long Island, New York at the amazing, storybook Cheka Castle. Their ceremony was also outdoor and featured beautiful white flowers and fabric to add a breezy air. The couple even got to enjoy a rainbow that miraculously appeared in the sky during the later photographs. And of course the couple’s first dance was nothing short of amazing! We hope that both these couples “dance off” into a blissful wedded future together!